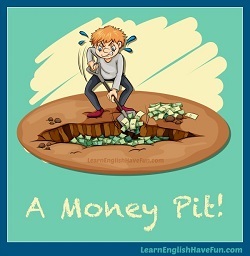 There are many money idioms in English and they are very common in every day conversation. What's an idiom? If you need a review of what an idiom is, just click here. It's the end of the season so there are sales in every store right now. You can bet your bottom dollar I'll be at the shopping center all day looking for bargains. 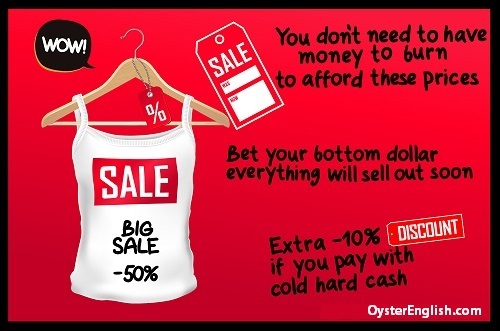 My friend never has to worry about buying clothes on sale because she's got money to burn. Last week, she spent 1,750 euros in cold hard cash on a pair of boots and a purse! Need help with the definitions? bet your bottom dollar: you can be very sure about something (you can be so sure of something that you can risk your last dollar or bottom dollar that it is true). You can bet your bottom dollar that this winter is going to be incredibly cold. I would bet my bottom dollar that you're going to get the job because you are the most qualified candidate that applied. money to burn: to have a lot of money that you can spend on anything you want. When I was working in the financial sector I had money to burn on every tech gadget that came out but now I have to watch my spending carefully. I thought I'd have money to burn when I became a lawyer but I have $200,000 in student loans to pay off. If I had money to burn I'd definitely buy a Ferrari or Lamborghini. Don't forget to go to the bank to get some cold hard cash before you go to the flea market. I'm sorry but they only form of payment we accept is cold hard cash. Here are seven more common money idioms. 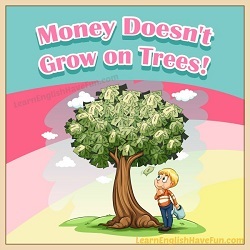 money doesn't grow on trees: it requires effort to earn money and it is limited so you must be careful how you spend it. When I told my daughter that money doesn't grow on trees she told me to write a check or use my credit card. It's important to help your children learn that money doesn't grow on trees at the very earliest age possible so they can become responsible with money. money pit: something that costs a lot of money over time (more money than was first expected). Everyone told me that getting two dogs from the shelter would be a money pit but after years of abuse I wanted to provide them with a good home. Old homes can be money pits so be sure to get a good home inspector before you buy. Conservatives believe that our aid program to Egypt has been a complete money pit. a fast buck: money that is quickly and easily earned. Ask my brother to help you raking leaves. He's always eager to earn a fast buck. When I was in college I made a fast buck checking student IDs at the library. My roommate is such a penny pincher. She refuses to pay $2 a month on our newspaper but always sneaks and reads it early in the morning before I get up. Just because I don't want to spend $5 a day on coffee at Starbucks doesn't mean I'm a penny pincher! rags to riches: involving a change from being very poor to being very rich. (Note: a rag is a piece of old torn cloth. Poor people sometimes wear clothing that is sewn together from rags). Oprah Winfrey is a classic rags to riches story. She was so poor growing up she used to have to wear dresses made out of potato sacks and now she's a billionaire. JK Rowling went from rags to riches after the success of her Harry Potter series of books and movies. strapped for cash: lacking money, not having any money. Aspiring actors and singers are often so strapped for cash they work as waiters until they become successful. I'm strapped for cash right now because I had $1,300 in unexpected repairs to my car. Can you tell me some ways to make a fast buck? Do you know anyone who's a penny pincher? Do you know of anyone who's had a rags to riches story? When you're strapped for cash, who would you ask to borrow money from?